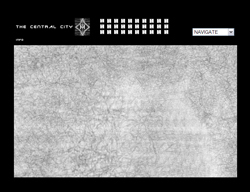 The Central City is an audio visual, interactive, net art, experience. 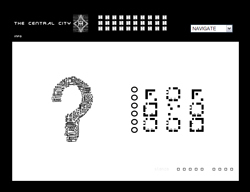 The Central City consists of text pieces, embedded sounds, all made for the internet. The city becomes an organic network of grids and diagrams, juxtaposing urban sights and sounds. 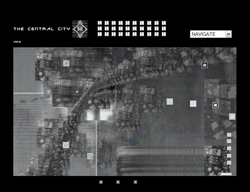 There are now over 30 areas of the Central City, and each area has lots of things within each section so chances are you won't find everything. Each area has multi soundtracks and multiple choices of pictures, using generative audio and image environments built into 3 d spaces. 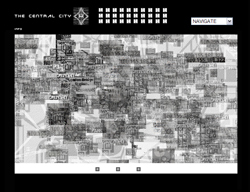 In total there are now over thirty areas of the Central City, and each area has lots of things within each section. 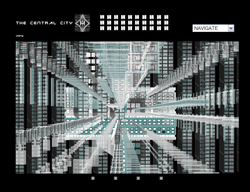 The works in The Central City have the following titles:- universa constructor videotron megalopotron univercity smallworlds textourama elevator maputor proser city central citoxity fostexity textus sounder randomizer cuboid matrixity advercity fibrinet. 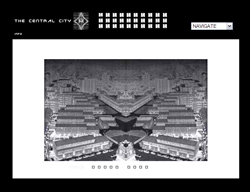 A version of The Central City artwork is also available on touch screen in a signed edition of 10 and several versions have been sold privately to collectors in 2004. Provenance. This net art project in various forms has also been exhibited at. International Awards for this project.VIDA 6.0. 2004. 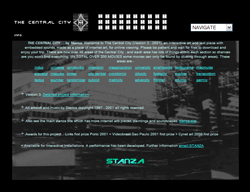 Links first prize Porto 2001, Videobrasil Sao Paulo 2001 first prize, Cynet art 2000 first prize. Now best with Internet Explorer (IE) No longer supported for other browsers. The idea is to go deeper into analogies for the organic identity of the city. The micro city becomes an organic networks of grids and diagrams.The form and content of this work is a visual world of the city and its structure. Networks of information technology are contrasted with organic networks and city networks. The project fuses the sounds of specific places.The sounds of language impose a rhythm that the visual narrative can interact with. 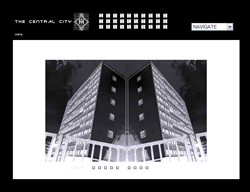 ‘The central city ‘, is an audio visual, interactive, internet art, experience. 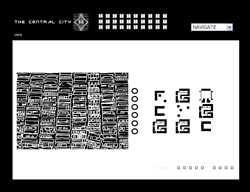 The central city consists of text pieces, embedded sounds, all made for the internet. The city becomes an organic network of grids and diagrams, juxtaposing urban sights and sounds. 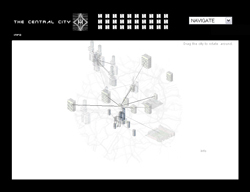 I wanted to develop analogies for the organic identity of the city as an urban community and make links with electronic networks and virtual communities. This organic interplay is contrasted with man made structures, as well as patterns and forms of urban design. The online spaces are for dreaming, thinking, meditating and transience. The form and content of this work is a visual world of the city and its structure. A visual labyrinth, a maze of circumstance. The city itself is always changing; it is always in flux. Each aspect of city life seems to demonstrate specific characteristics, which can be developed into individual parts of the labyrinth, making up the images that will be used. A city experience consists of small unit blocks and cells which inter-relate and lock together to form the composite city identity. The city has moved from metropolis to megalopolis to the ecumenopolis. The city is everywhere, with lifeless design spreading upwards and forming a conundrum of physical objects in space. 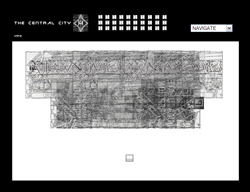 A city form is a conundrum of physical objects in space. Cities become "insect colonies", spreading upwards with giant towers looming over vacant lots, and empty spaces. My artistic intervention tries to look at fragments of our experience of cities, that make up the whole city. 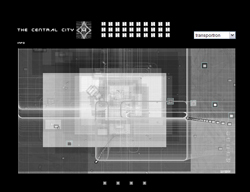 The central city, is a place which appears out of control, but which we try to control through design. The city as grids, and repetition, can appear sublime or it can confuse and appear prison like. Giant cities paint a gloomy picture, of mass urban sprawl; the megalopolis is spreading upwards and everywhere to house a population of which 70 - 80% now lives in cites worldwide. 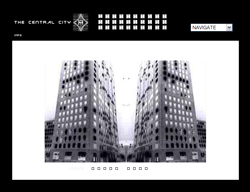 These online works represent spaces, they are idealised spaces. 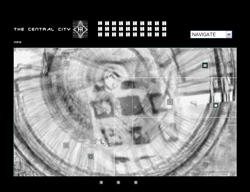 I don’t see ‘the central city’, as a simulation. In fact, I am not aiming or particularly interested in simulation. I view the final evolution of the project as a experience, an online internet experience, which can be viewed inside the white cube of the box which is a computer. The framework, the grid, that contains this work is the computer and the internet. Images of maps redrawing and reprocessing themselves. This allows the city a perpetual evolution, no single similar path need be followed. I am interested in the sounds of specific places, and how the sounds reflect this identity and re-impose characteristics back onto the location or environment. Cities all have specific identities, and found sound can give us clues to the people that inhabit these spaces, as well as provoking us and stimulating our senses in a musical way. The sounds of language impose a rhythm that the visual narrative can interact with. 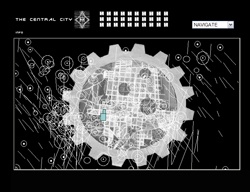 The intention within newer sections of the central city, is to create an audio visual experience that evokes place, both as literal description but also developed musical composition. These are the ideas that are informing my new ‘soundmaps’ series , and ‘soundcity’. 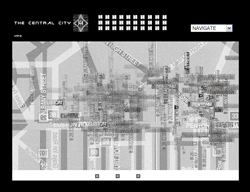 The city codes itself up into a growing patterns, based on algorithmic patterns. 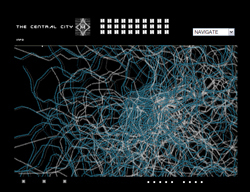 The digital city experience. This is a playfulness not far or dissociated from the playfulness of the situationist critique. And like the situationists, they also wanted to build cities. 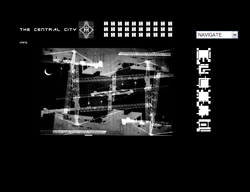 My initial response in the central city project for example was to deconstruct a language of the urban and city environment, and then to build it back up as an art image to try to constitute both a new form and new meaning. By placing oneself in the middle of this particular structure, the meaning or the aesthetic experience is only encountered when you decide to move from any one place to the next. I use these small fragments as rhythms, to interact with the next part, and evolve into something new. These parts are cells, or parts of a whole that generate itself. The nature of the sounds and noise of cities varies in tone and language. A background rhythm can come into the foreground. It mixes itself, and evolves. The city is its own music, constantly evolving, a beautiful composition of squeaks, clanks, and pulses. We are familiar but distracted as it bombards our conscious slipstream. Yet the sounds evolve, generate, move, die, fade and shift. The sounds of the city are out there all the time, there is no silence, the code does not stop. The children, the trains, the drills, the animals, the micro sounds, the sounds of our bodies, the sounds of the street, the insides of our souls. Familiar forms, identities and sounds are common to all cities, and yet each have special forms that separate and identity particular places and spaces. 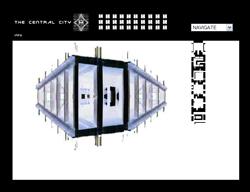 All the sounds are recorded from mini -disc and originally sourced they are then fed into the central city. The sounds files work in differing way, some are looped, some are mixed, and some are generative. There is even a jukebox section, where sounds stream down off the juke box from the server and you can re-enact you own karaoke at home, by reciting the words over the top of the industrial city soundtrack. 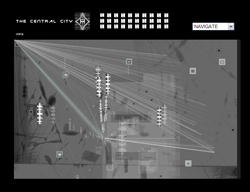 ‘The central city‘, moves away from these ‘linear’ pieces, into a more non linear and interactive experience, giving the audience some control over the artwork. The city allows you to experience different artwork depending on how you choose to navigate. There are also random ways to experience this. As well as this non linearity, some of the pieces change over time. Evolving pieces exist, that the "user" has to control to make them work, the user also can input changes of sound and picture. This change in the relationship between the audience and the artist could be said to change our perception of the artwork. I am evolving a situation where the audience may not only participate but also by giving them some control, contribute to the form and content. The work is exploring this changing relationship between the audience and artist. The user makes the decision to change sounds and pictures, where to go, what to see, what to hear. This can be done by movements within the grid. This change in the relationship between the audience and the artist changes our relationship to the artwork. The user can choose what they experience, synthesizing converging media, systems, and phenomena in the process. 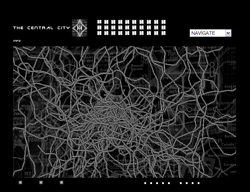 The city codes itself up into a growing patterns, based on algorithmic patterns. The digital city experience. This is a playfulness not far or dissociated from the playfulness of the situationist critique. And like the situationists, they also wanted to build cities. 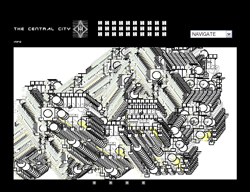 ‘The central city’ has become an amalgamation of ideas from art, architecture , design and urbanism united within the spirit and the ethos of the situationist movement. Mouse down events pull in different sounds and allow the user some control over what users experience. As well as this, generative sections allow images to morph and change and move about the screen in a three d space. The sections are position controlled or mouse controlled. Small buttons can attach generative sounds to images and these build up and decay over time. Most of these works have extensive mouse control. As the user moves the light and the image changes. 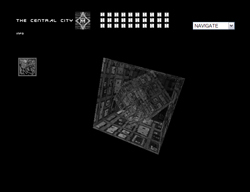 A copy of the whole internet project is now also available on cd rom; and versions exist that can be exhibited as an installation for larger spaces with bigger facilities. The has work evolved since 1997 to its current version and form. This version now online is version 5 circa 2003. A copy of the whole internet project is now also available on cd rom for exhibition purposes; and versions exist that can be exhibited as an installation for larger spaces with bigger facilities. 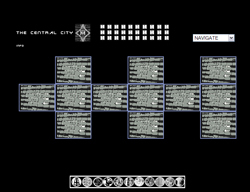 A performance is also in development which allows the website to be played on multiple computers. The website is projected using several projectors. While at the same time the sounds are then sent to new and especially written software in max msp. This software remixes and fuses the sounds. This has been performed live now of several occasions within an exhibition context . 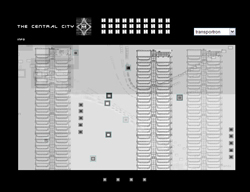 The central city draws its influence from these urban works in other media but as an online interactive work it has evolved over several years to its current version and form. The work started in 1996 and the first version went online in 1997. It is now in version four and the website also include other works like soundcities, and inner city which developed out of this. Technical points. You will need shockwave for some areas and will not be able to listen to my music or experience this work unless you get shockwave. You must have downloaded and installed the shockwave plug-in available from the macromedia website. Thanks to all who have helped on various parts of the site particularly architects, planners and urban dwellers. Thanks also to all who have helped with code when I needed some help. Thanks to all browsers that allow you to see the work, to software companies, and special thanks and shout outs to adam hoyle, director online, atty, danny brown, vicky forrester, dug group, open source, the net and all freeware. 2. "This net art work, made over four years, is an impressive collection of interconnected environments created using generative procedures. The focus is on urban environments, resulting in a vast web site of interconnected idealised spaces and polyphonic neighbourhoods. These environments explode with ideas from art, architecture, design and urbanism. Visuals from live web cams and pre-recorded audio are controlled by the user to make spaces that fragment and are reconstituted in real time. 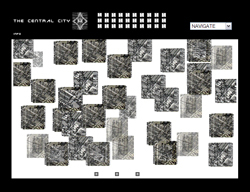 The ever-changing nature of the city is foregrounded in the way that its features flow through the site; streets and buildings seem to change right before our eyes in visual compositions reminiscent of Dziga Vertov’s avant-garde documentary “The Man with the Movie Camera.” Users of The Central City interact with the piece by selecting from multiple menus based on an iconic language. Starting from recognizable imagery that is either pre-recorded or live, viewers can morph images and algorithmically change sounds. Through these processes, ordered and grid-like cities slip into disorder, and surveillance systems are subjected to processes that make them “bleed”, that “torment” them and subject them to “earthquakes”. 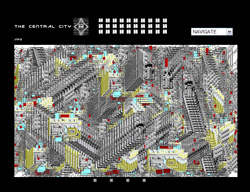 The sophistication and subtlety of the image generation reflects Stanza’s earlier paintings, and provide a sophisticated, adult alternative to SimCity. The user is encouraged to take a painterly approach to image transmutation, resulting in a subtle and ironic convergence of art and civic issues." Jury Stament Life 6.0 competition in Madrid – Daniel Canogar, Chris Csikszentmihalyi, Machiko Kusahara, Rafael Lozano-Hemmer, Jane Prophet and Nell Tenhaaf – reviewed 71 artworks that utilise artificial life concepts and techniques. Each of the latter constitutes a work within the work, a city within the city, and visitors have full leisure to explore each of them, make discoveries, get lost, and double back, over and over again. 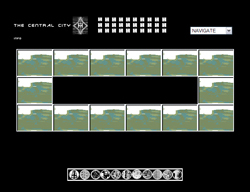 Thus, the work within the work that is itself entitled "The Central City" includes no less than thirty subsections: universa, constructor, videotron, megalopotron, univercity, smallworlds, textourama, elevator, jukebox, sounder, maputor, proser, city central, citoxity, fostexity, textus, sounder, randomizer, cubix, matrixity, advercity, fibrinet, advercity, fibrinet, envirus, germix, …"Each has multi soundtracks and multiple choices of pictures, using generative audio and image environments built into 3 d spaces and user controlled 3 d areas. "2 In all, more than 200 little films. Thus, in exploring the nooks and crannies of Central City's subsections, and those of other cities-within-cities - sonicity, biocity, etc. -, one finds collages of images - often re-touched or processed photos or films of "real" cities, like London, Barcelona, etc., and computer-generated abstract drawings - and sounds - sampled in cities or electronically created -, along with pictures of futuristic buildings and improbable skyscrapers. One thinks of the city plans one typically finds in science-fiction. Yet these ones often become philosophical ruminations on the current state of cities, on what they are, what they can be, at the most abstract yet most important level, that is, beyond their status as concrete housing projects, on the relationships and interactions between their settings and their residents. 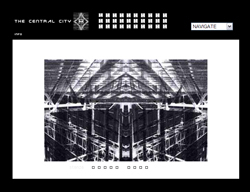 As its author emphasizes, The Central City is not a "simulation" or representation, it is an "experience"3, as much for its creator - who has been "in progress" with this work since 1997 - as for the visitor, whom the many interactive elements of the work draw into participating in the creative process.